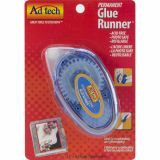 Ad Tech Glue Tape Dispenser - AD TECH-A permanent glue runner. Acid free, photo safe, and refillable. Ideal for scrapbooking and giftwrapping. 0.31 x 8.75 yards. Bonds instantly-no mess gluing-perfect for paper crafts. Easy to refill and convenient to use. Outside is blue but transparent so you can see through it. Includes clear cap.